Combined visible and infrared images of M104. An “accretion disk” of dark dust and gas surrounds this mighty collection of 400 billion stars. It is electrical energy that powers and shapes these features. M104 is probably the most spectacular representation of “lens-shaped” galaxies that has been produced by any telescope. Originally discovered by Pierre Méchain in 1781 and then added to Messier’s famous catalog in the same year, M104 remains a centerpiece of scientific investigation after more than 300 years. William Herschel independently rediscovered M104 in 1784. 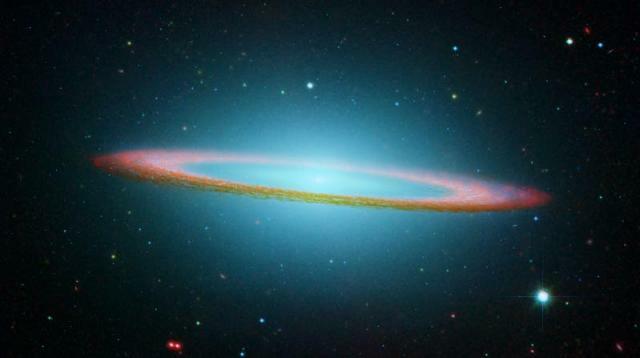 The Sombrero Galaxy is actually much larger than what can be seen in the image above. The galaxy is surrounded by a halo of stars, dust and gas that indicate it may actually be an elliptical galaxy that contains a more robust interior configuration. Shorter time exposures reveal distinct spiral arms radiating from the center and it is referred to as a “spiral galaxy” by astronomers. M104 is surrounded by globular clusters in the hundreds – a much richer population than our own Milky Way or most other observed galactic bulges. Astronomers have long maintained that galaxies are clouds of hydrogen gas and intergalactic dust that have been compressed by gravity until they coalesce into glowing thermonuclear fires. In the recent past, the community has also proposed that the centers of most galaxies contain black holes of unbelievable magnitude. It is the activity of these “gravitational point sources” – some as powerful as the gravity field from 200 million stellar masses – that causes the galaxies to spin, globular clusters to spawn, tremendous jets of gamma and x-rays that span thousands of light-years to appear, and (among many other features) “radio lobes” that are larger than the galaxy out of which they discharge. As most conventional researchers have noted, the fact that galaxies and other celestial objects spin is attributed to the early formation of their structure. A galactic embryo is said to possess an angular momentum that increases as it begins to fall into its own gravity well. In an oft-repeated illustration of how this occurs, we can visualize an ice-skater doing a pirouette. As the skater’s arms are drawn in closer to the body, the spin-rate increases. Thus, as the galaxy begins to contract the acceleration of the cloud increases, causing spiral arms to form, a disk of material to begin surrounding the central nucleus and globules from eddy-currents within the gases to condense into stars. This all occurs because the spin in the cloud overcomes the gravitational attraction through centrifugal force, throwing material outward like a drop of paint on a spinning platter. 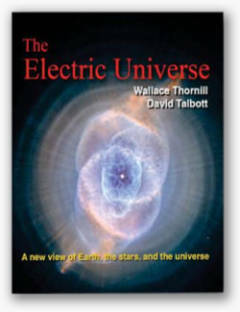 The Electric Universe model does not permit the condensation of galaxies from cold, inert hydrogen and specks of zircon no bigger than an molecule. So, what are galaxies? In 1981, Hannes Alfvén presented his hypothesis for “electric galaxies”. 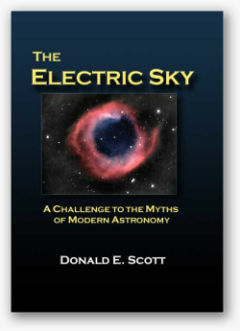 He said that galaxies are actually very much like a device invented by Michael Faraday, the homopolar motor. A homopolar motor is driven by magnetic fields induced in a circular aluminum plate or some other sufficiently conductive metal. The metal plate is placed between the poles of an electromagnet that causes it to spin at a steady rate proportional to the input current. The meter attached to the wall in most backyards that determines monthly electric bills is a homopolar motor. So, what does this mean for galactic genesis and evolution? Galaxies exist within an inconceivably large filamentary circuit of electricity that flows through the cosmos from beginning to end. There is no way to know where this current flow rises, or to what electrode it is attracted, but we see the effects of its electromagnetic fields in the magnetism and synchrotron radiation that permeate space. That electricity organizes itself within fields of plasma that are sometimes larger than galaxy clusters. The plasma is composed of neutral atoms, but a small fraction of electrons, protons and other charged particles are also present. Those particles, and the charge-neutral ones they sweep along with them, are driven by the larger electromagnetic field to form “pinches” of matter. As many of the plasma pioneers have pointed-out, plasma isolates its charges within “double-layers” folded inside helical tubes called Birkeland currents. As the currents propagate, their mutual attraction causes them to “pinch” into tighter and tighter helices. In Electric Universe theory, the clusters that formed in the pinch zones of Birkeland current strands around M104 show it to be extremely active. The large number of clusters and a distinct “homopolar disk” are a sign of electrical activity. Filaments exist everywhere: from sparks that leap from doorknob to fingertip after walking across a nylon carpet, to flashes of lightning, to collimated “jets” of x-rays that erupt from the axes of galaxies (and stars), to the cosmic “strings” of superclusters that make-up the large-scale structure of the universe. To elicit such displays the forces of gravity and inertia alone appear to be insufficient. 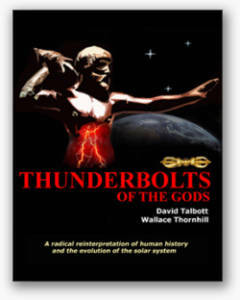 The primal electrical energy source is orders of magnitude more powerful than gravity. The “plasma ropes” that comprise Birkeland currents attract one another over distance in a linear relationship, rather than through the “square-of-the-distance” proportions of gravity. That makes Birkeland currents the most powerful long-range attractors (and also short-range repulsors) in the universe. Electric currents flowing through dusty plasma beget and sustain the galaxies.